Sometimes beekeepers use “swarm traps” to entice a swarm of bees to move into our trap instead of some random branch somehere or the walls of your house. The trap is removed after dark when all of the bees are inside. The bees can then be easily moved into a managed hive. 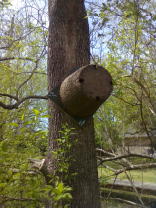 With the assistance of the Texas A&M AgriLife Extension Service - Fort Bend County, the Fort Bend Beekeepers Association makes honey bee traps available for use in areas where honey bee swarms are common. Please understand that no trap will entice bees to leave an established home. By providing links to other sites, Fort Bend Beekeepers Association, does not guarantee, approve, or endorse the information or products available on these sites.